Pransellknit » Blog Archive » Where’s my WIPs at? I know I’ve made a terrible grammar faux pas in the title, but it reminds me of a Basement Jaxx track with a somewhat disturbing monkey/human video. So, the grammar crime remains and I refuse to show any remorse for it. Anyhoo, this is just a short update on my two WIPs. First up is a Variation of Cable Stitch. It sits before me as an almost complete jumper and even though I’m the only one who has worked on it, I’m surprised it’s nearly there. Since last mentioning it, I knit the sleeves and made minor ‘edits’ to the front to make the neckline a little lower at the front. It’s becoming increasingly apparent that I do not sport a graceful swan-like neck, so I suspect I’ll be making a lot more of these kinds of modifications in the future. All that’s left to do is sew down the facings, give it a wash and then take it in to the lovely people at Buttonmania to find some buttons. 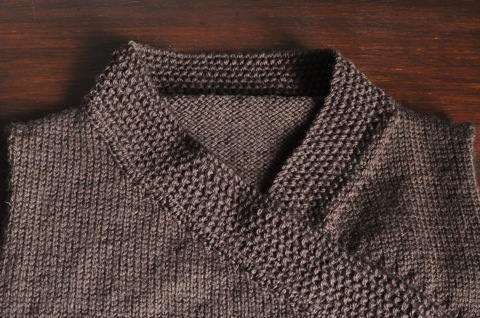 My other WIP is the brown jumper of immense frustration. Last time I mentioned it, I was getting increasingly annoyed at the hiccups I was encountering along the way. Since then, I’ve finished reknitting the button band and have almost finished one of the sleeves. It’s been quite the voyage of discovery, reworking those two parts of the jumper. One of the things I discovered was the importance of seaming technique. On my first attempt at attaching the button band I used my default seaming method, mattress stitch, to attach the band to the body. Even though I had a lot of button band leftover, I didn’t realise that I was stretching button band out a lot. To show you how much, the strip of moss stitch sitting on top of the jumper is the original button band; it’s probably two thirds of the length of the current button band. The new button band is attached using whip stitch, which worked a treat. I hadn’t contemplated using whip stitch for button bands before, and it was only because I accidentally saw mention of it in A Stitch In Time Volume 2 that I tried it. It was a proper happy accident. The other thing I realised was that there was absolutely no chance of easing the sleeve into the armhole on my first attempt. This was primarily because I’d cast on 10 stitches less than I was meant to, and had, in turn, knit 10 rows more than I was meant to. This spectacular misreading of the pattern is probably my best bout of dufferism of late. Even after removing the 10 extra rows, the sleeve would still probably be a bit too big. I’ve made the sleeve smaller again, and even though it’s looking a lot better, the lack of precision is upsetting me a little. If I wasn’t so far into reworking the sleeves, I would definitely use this tutorial from By Gum By Golly. It would pretty much solve all of my problems (except the whole duffer thing). How about you, where’s your WIPs at? 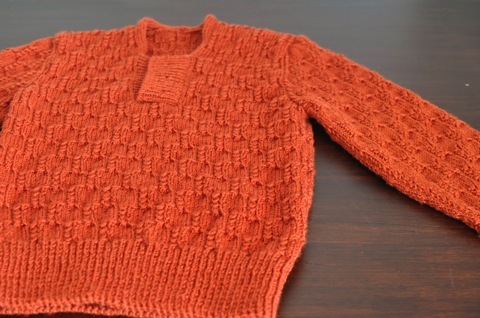 the orange cabled jumper is a beaut! I think I’ll be forever lowering necklines of vintage knits too – but my alterations are to deepen V-necks to try and visually slice some volume from my ridiculous boobage. Also, I love the orange – I’m flirting with the idea of a vintage knit in Bendi Mill’s “nectarine” once I have my three current wips off the needles. You seem to be making great progress to me. I have a blanket on the needles that I started on 22 October and might, with a bit of hurry-up, get finished by the end of November. On the other hand, I have a cardigan on the needles that isn’t going anywhere as I consider that it may be too large and, knitted in a cotton/acrylic blend, may stretch to an even larger size!